Set in the shattered subway of a post apocalyptic Moscow, Metro 2033 is a story of underground survival where the fate of mankind rests in your hands. Due for release next year, Metro 2033 is a first-person shooter focusing on events that stem from the year 2013 when the world was devastated by an apocalyptic event, annihilating almost all mankind and turning the earth’s surface into a poisonous wasteland. A handful of survivors took refuge in the depths of the Moscow underground, and human civilization entered a new Dark Age. The year is 2033. An entire generation has been born and raised underground, and their besieged Metro Station-Cities struggle for survival, with each other, and the mutant horrors that await outside. You are Artyom, born in the last days before the fire, but raised Underground. Having never ventured beyond your Metro Station-City limits, one fateful event sparks a desperate mission to the heart of the Metro system, to warn the remnants of mankind of a terrible impending threat. The journey takes you from the forgotten catacombs beneath the subway to the desolate wastelands above, where your actions will determine the fate of mankind. It sounds very similiar to FallOut, blending RPG, exploration and first person shooter elements, as you explore desolate lands taking down creatures that threaten your survival. The trailer below was released quite some time ago, but there are few new screenshots knocking around if you search the net and one new one below that we've included in this preview. 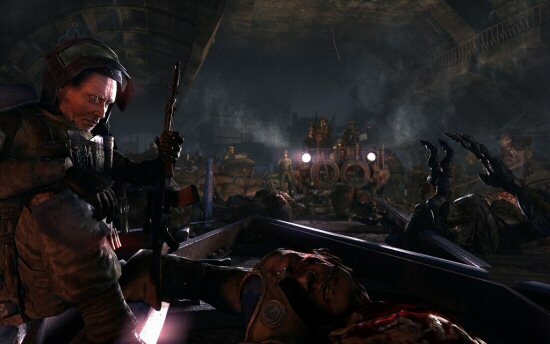 Though Metro 2033 hasn't even been released, its future as a series already looks likely. The idea for Metro 2033 spawns from a Russian sci-fi novel penned by Dmitry A. Glukhovsky which sold extremely well in Russia. This year he released Metro 2034, which has also become a best seller, so Metro 2033 should be just the start of the apocalyptic journey. This is Russian developer's 4A Games first ever title and they've been working on it exclusively since 2006, so Metro 2033 is an unknown entity thus far, but judging from the trailer it's going to worth keeping an eye on. Currently, only the PC version has been confirmed. Judging by the description, it'll be a bit like a computer-game based game of spot the difference. what's Russian for “mind the gap”? IGN yesterday or check the official THQ site.